"Urban is London's driving school"
Terry Shipton, passed first time, December 2006 at Mill Hill. 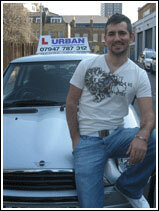 The ultimate in driver training, Urban is one of the fastest growing driving schools in London. Apply for your provisional licence and learn to drive with Urban. Special price for your introductory 1st hour, we also provide advanced block booking and student discounts as well as a 40 hour intensive course. Let Urban help you take and pass your theory and hazard perception test. If you would like to learn to drive at a much quicker pace, then why not take advantage of our fantastic 40 hour intensive course. Once you have passed your driving test, ask your instructor about Pass Plus or improve your motorway driving. If you feel you are lacking driving practice, why not take our refresher lessons. Let Urban help you to pass your theory, hazard and practical tests, contact us via email or phone. Links to help you find websites related to driving and insurance. Use our sitemap to help you find your way around our new website and all the information you need to help you achieve your full driving licence.